Today I'll be reviewing an Ebay store and share my recent purchase as a returning customer. My personal thoughts will be in green italics. ✤ Brands Offered: Laneige, Mamonde, IOPE. Considering the number of cosmetic brands under AP (see above), their Ebay store isn't amazing in brand variety. ✤ Product Variety: limited; mainly offers best-selling skincare products. ✤ Product Description: Convenient to have product details under each listing, with lots of graphics to boost. I hate guessing what products target to do and having to search up endless blogs in order to find out basic information like that. 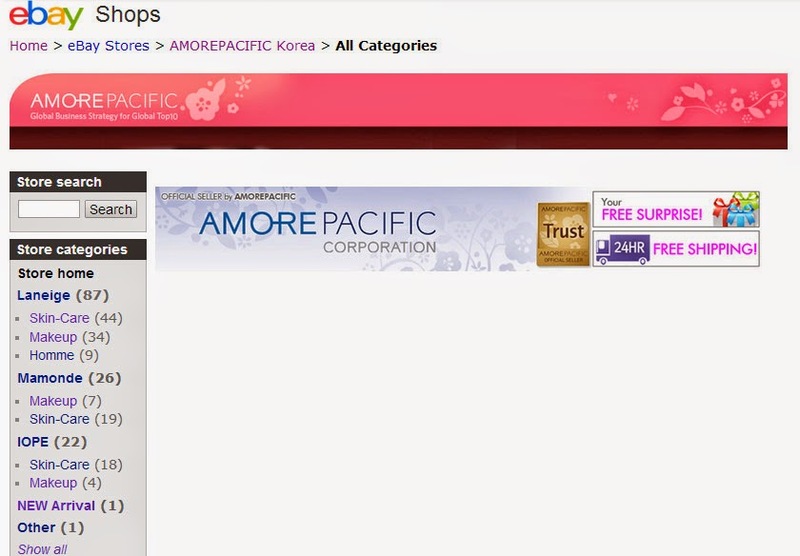 "We are official eBay account of Korean Cosmetic Company "AMOREPACIFIC". 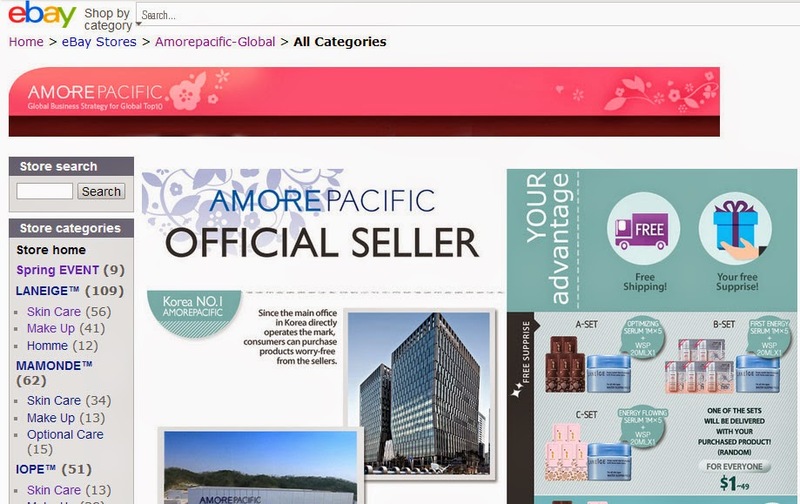 We selling Genuine article that is officially distributed by AMOREPACIFIC Head Office in Korea." I first began buying from them three years ago, seeing that they are AP's official Ebay stores . Everything I've received so far were genuine (I compared with actual items bought from Airport Duty Free stores), and they never broke me out. ✤ Price Point: Pretty standard (in other words, average) compared to other sellers on Ebay and independent online stores. ✤ Shipping Duration: around 10 ~ 14 days from Korea to Toronto. They offer EMS as well. 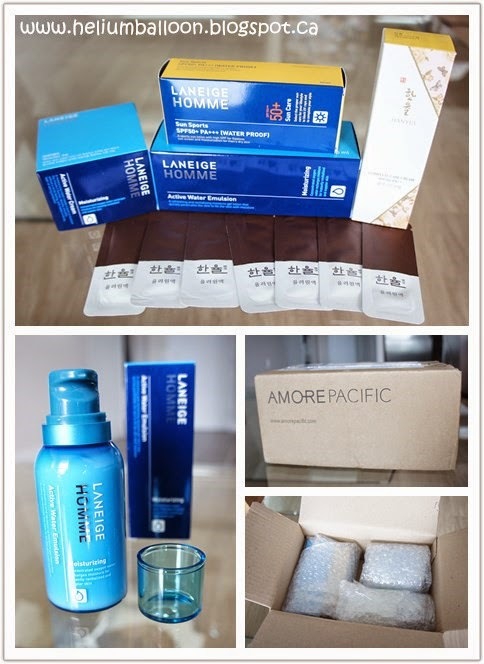 ✤ Packing: Meticulous with bubble wrapping, nicely arranged in an official AmorePacific Box. Items always came in pristine conditions. ✤ Any Samples or Promotions? Yes. When I bought my first Laneige basic set two years ago, they had specials if you bought items in twos. They currently offer samples and even full size AP brand products when you spend a certain amount or buy a certain product. Promotions change every month ... check global store's homepage for details. 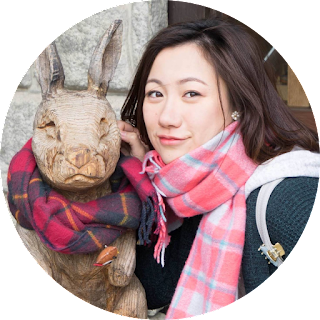 ✤ Customer Service: since there has never been issues with my purchases, I never had to contact them via email. That's a good thing, isn't it ;) ? ✤ Repurchase? Yes. I think so. My poor hubby has dry patches on his face and never wears sun protection even when doing sports. He cares about his skin but doesn't know what to buy. Considering my success with Laneige basic skincare in the past few years, I bought him products from the Laneige Homme line to try, and a sun screen for our upcoming trip from the AP Korea Ebay Store. 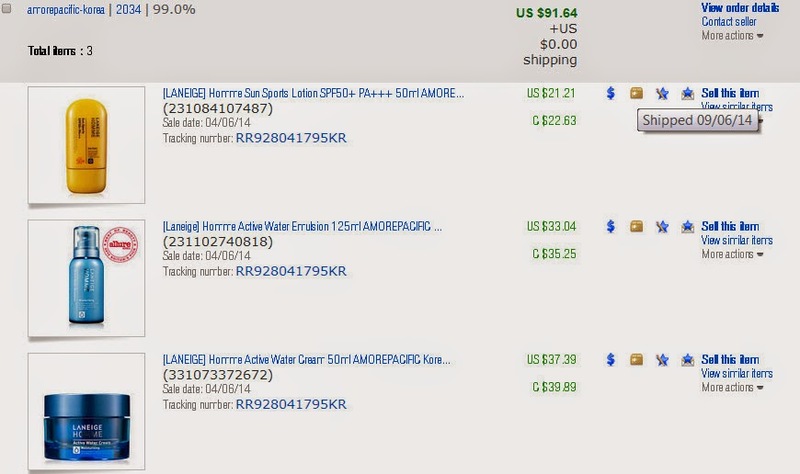 You can see the prices, items and the tracking number above. I received my buyer's ratings promptly after paying. All my goodies were wrapped nicely and placed snugly in the AP box. I was surprised to find the additional 40ml Hanyul Complete Care Cream (CC cream), and 7 Hanyul Optimizing Serum samples! I thought there was a mistake as I never ordered (or even heard of Hanyul) CC cream. When I checked their Global store, the June promotion indeed includes 7 x Hanyul serum samples and a 40ml CC cream if purchase exceeds $50. That was a nice surprise! I do not want to give ratings to stores because I alternate between online sellers depending on my requirements for specific orders, such as shipping time, price point, order amount, sample selection, customer service etc. Therefore, there is no all-time winner for me, but just a few favourites.